Third wave. Second aircraft to attack Sorpe Dam. Mine dropped successfully, but failed to breach dam. Herbert John Hewstone was born on 24 July 1909 in Stepney, London. He was one of the seven children of George and Lydia Hewstone. The family owned a general store in the area. Hewstone was generally known as Bert to his family, but in the RAF he went by the nicknames of both “Harry” and “Hewie”. He joined the RAF at the start of the war, but it wasn’t until 1942 that he began aircrew training, qualifying as a wireless operator/air gunner in June 1942. He was posted to 19 OTU in Kinloss at the end of August, and quickly crewed up with Ken Brown, Steve Oancia, Grant McDonald and Dudley Heal. 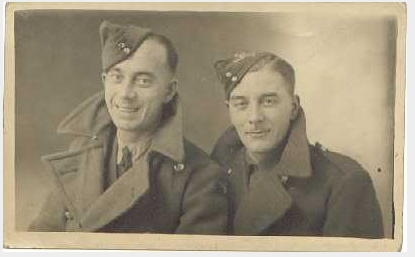 They were posted together first to Coastal Command and then after final heavy bomber training on to 44 Squadron at Waddington in February 1942. By this time, Don Buntaine and Basil Feneron had joined them. Hampered by mist, Brown and his bomb aimer Steve Oancia found it difficult to get the correct line of attack at the Sorpe Dam until Brown remembered a similar situation during training, trying to land at RAF Wigsley. He had solved the problem by dropping flares at pre-arranged intervals, then using them on the next approach. Hewstone was given the task of dropping them, and the tactic worked. Hewstone went on to fly on all of the Brown crew’s subsequent operations in 617 Squadron until it disbanded in March 1944. He was posted to 26 Operational Training Unit, where he served as an instructor for the remainder of the war. He was promoted to Flight Sergeant before being demobbed. Herbert Hewstone died on 28 May 1980. Thanks to Gordon L Hewstone for help with this article. Survived war. Died 28 May 1980.